Heraldry on the first page of the Psalms text strongly suggests that this Psalter was commissioned by King Edward I for the marriage of his son Alphonso, to Margaret, daughter of Florent V, Count of Holland, which was to take place in 1284. Alphonso died before the wedding, however, and the decoration of the manuscript was left incomplete. Additions were made in the early 14th century, probably before 1316. 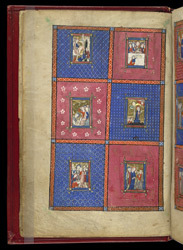 These six small scenes were cut from a late 13th-century manuscript, probably a Book of Hours or Psalter made in France, and pasted into the present manuscript in England in the early 14th century. They show Christ's Entry into Jerusalem, The Last Supper, Christ Washing the Feet of the Disciples, The Agony in the Garden, Christ's Betrayal and Arrest, and Christ Before Pilate. Each miniature is much smaller than the compartment it occupies, but this is disguised by the painting of the backgrounds.